Carlos Reutemann won the Belgian Grand Prix but it was a weekend marred by endless bickering over the legality of cars and the death of a mechanic when he fell from the pit wall and a serious accident involving another. Reutemann had been an innocent party in an accident in practice when an Osella mechanic fell from the tiny and cramped pit wall and landed between the wheels of the Argentine's car. The mechanic, Giovanni Amadeo, died of his injuries. In the race itself, the Arrows head mechanic was run over and suffered broken legs. The FIA's continuing inability to explain clearly what was and was not legal just added to the sense of anarchy. The farce of new regulations over body height was evident when cars slowed half a lap from the pits to allow their suspension to decompress enough for them to pass the fixed centimetre ground clearance rule. Alan Jones failed to pass the test and found his fastest qualifying time disallowed. Ferrari also made itself less than popular when it alone protested that rules limiting the field to 30 cars should be invoked, sidelining Patrick Tambay's Theodore. Ferrari then vetoed a suggestion that a pre-qualifying session be held. The troubles didn't end there as a bizarre start line accident followed. As the cars lined up ready for the lights a variety of drivers suffered overheating water temperatures and waved their arms as a warning that they had stalled. The organisers started the race as Arrows mechanic Dave Luckett leapt over the pit wall with an air line to fire up Riccardo Patrese's Arrows which had stalled. As he crouched behind the car, the field blasted away and the yellow flag near the Arrows had been withdrawn. Those at the back of the grid were accelerating when the second Arrows of Siegfried Stohr ploughed into the back of Patrese injuring Luckett in the process. Stohr was beside himself with grief but the race carried on. The person who helped out most was Didier Pironi. He stopped his car on the grid and forced everyone else to stop. The organisers had no choice but to halt the race. Forty minutes later the race was restarted and Reutemann took the win with his championship rivals suffering problems. Alan Jones and Nelson Piquet tangled and the Brabham spun into the catch-fencing and Jones missed a gear and went off later in the race. That allowed Jacques Laffite up to second in the Ligier from Nigel Mansell's Lotus. 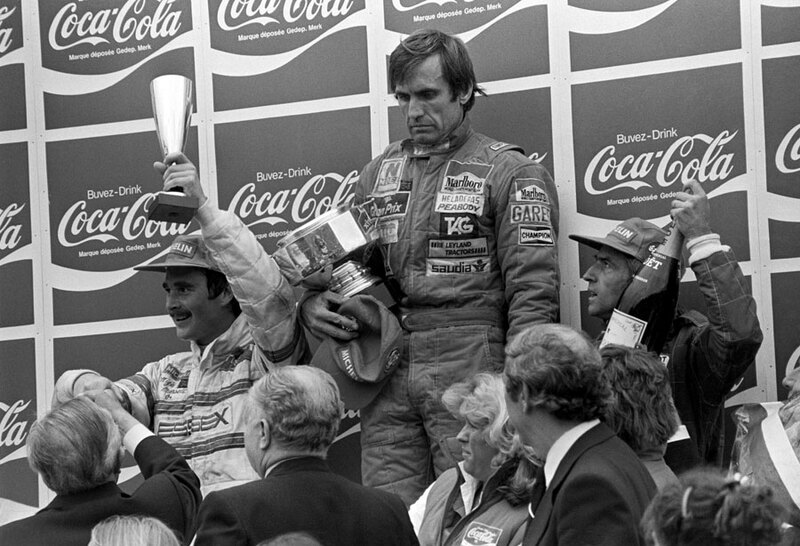 It also gave Reutemann a 12-point lead in the championship but he was in no mood to celebrate. A rare good news story came from Lotus. The team had missed the previous race after the FIA banned its new Lotus 88, but Colin Chapman dusted down the old Lotus 81 and was rewarded with Mansell's third and Elio de Angelis' fifth. A shambolic weekend was not quite over. Rene Arnoux was arrested following an altercation as he left the circuit and spent several hours in a local jail.